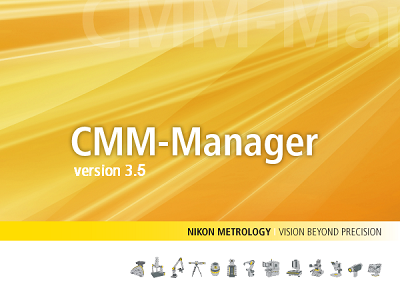 CMM-Manager is a task-oriented, highly intuitive CMM metrology software package for both manual and CNC coordinate measuring machines. It is a fully integrated environment featuring walk-in quick-measure, one-click CAD-measure, collision-free CAD-teach, virtual simulation, real-time verification, advanced path planning, CAD alignment, datum alignment and many more smart functions. Object oriented interface allows easy program creation without seeing complex text programming language. CMM-Manager will upgrade most new and used CMM’s using existing hardware and is Windows 7 thru 10 compliant while supporting legacy Windows systems back to XP. A zero hardware retrofit is achieved with CMM-Manager, directly interfacing to CMM controller via serial, USB, Ethernet, GPIB, PCI / ISA expansion cards, WiFi and more. CMM-Manager supports probing systems including Renishaw PH20, SP25, TP20/2, Zeiss RDS, ST, TesaStar, USB and composite cameras, and more. For manual CMM’s if a plug-n-play interface is not available, a USB interface / retrofit can be provided that will work with any metrology equipment. CMM-Manager also offers flexible yet easy-to-use functionalities, including graphical probe configuration management, automatic tip calibration, cross section scanning and group feature measurement. Simplify your metrology tasks through our intuitive yet powerful software. Task oriented working environment with intuitive interface design, easy to learn and easy to use. Output to Printer, Microsoft Excel, several SPC, AS-9102, etc. Actual measured data exported to CAD can be used to take your reverse engineering application to new heights of efficiency and accuracy.